Speech-language pathologists (SLPs) and medical health professionals recommending a speech-generating or communication device often encounter questions from caregivers about the research supporting the use of augmentative and alternative communication (AAC). Many caregivers are concerned that an AAC device might hinder the development of their loved one's communication skills or stop the advancement of their verbal abilities. However, research and experience show that AAC supports and encourages the progression of speech and language skills. 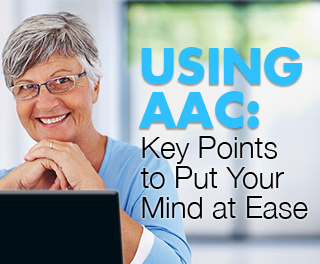 Read on to put your mind at ease and answer some of the most common concerns about using AAC with your loved one. Myth: AAC will hinder the development and use of natural speech. Fact: Analysis of AAC-specific research shows using an AAC device does not stop or deter the progression or recovery of natural speech, and conversely may benefit the recovery of natural speech skills. Myth: AAC means the SLP is giving up on recovering my loved one’s speech. Fact: This is one of the greatest concerns of family members when an SLP introduces the idea of trying an AAC device. However, it could not be further from the truth. In fact, AAC provides a way for individuals to successfully communicate their wants, needs, and feelings, as they continue to practice the recovery of natural speech. Without AAC, an individual with a communication disorder is at a higher risk for cognitive, social, emotional, and behavioral problems. The ideal AAC system will allow your loved one to communicate with a variety of people in different environment at all times. Your SLP will work to ensure the AAC device is a total communication system that provides a range of communication methods, including speech. Myth: We don’t need an AAC system if I understand what my loved one is saying. Fact: You may understand what your loved one is saying, but others may not. In order to participate in daily living activities including socializing with friends and family, ordering a meal at a restaurant, going to the bank or the doctor’s office, your loved one may need an AAC device. Myth: If my loved one starts using AAC to communicate, he/she will continue to rely on it, instead of working to recover their verbal speech skills. Fact: Recovery is an ongoing process, and active and purposeful engagement by both you and your loved one is crucial. For many stroke survivors with aphasia, an enjoyable, stimulating, frequently used and extensible AAC system may be an important component in the ongoing rehabilitation process. The right device can be used as needed to support, replace, provide cues to facilitate the use of verbal language and even help to restore your loved ones verbal skills so that they can speak for themselves in all situations. As a longtime AAC professional and committed SLP, I've recommended devices for children and adults. Whether it's working to establish a lost communication line or providing therapeutic activities, these devices are vital to the well-being of many. As always, if you want to learn more about the research behind Lingraphica's devices, visit our research page or call our clinical team. Ready to learn more about our speech-generating devices? Call our team at 888-274-2742! Blischak, D.M., Lombardino, L.J., and Dyson, A. T. (2003). Use of speech-generating devices in support of natural speech. Augmentative and Alternative Communication, 19 (1), 29-35. Millar, D.C., Light, J.C., and Schlosser, R.W. (2006).The impact of augmentative and alternative communication intervention on the speech production of individuals with developmental disabilities. A research review. Journal of Speech, Language and Hearing Research, 49 (2), 245- 254. Romski, M. (2005). Augmentative communication and early intervention; Myths and realities. Infants and Young Children, 16 (3),174-185. Steele, Richard D. (2004). Benefits of Advanced AAC Technology Uses to Adults with Acquired Aphasia. Augmentative and Alternative Communication. *Adapted from the positive AACtion Information Kit for AAC Teams from Rocky Bay, 2010.